This month takes us to French Guadeloupe, a collection of islands in the Caribbean about 400 miles off the shores of Puerto Rico, and into the heart of a mysterious death. With each chapter Conde introduces a new character (suspect? lover? friend?) whose stories elegantly weave together into a portrait of the dead man and the tropical small town of Riviere au Sel. 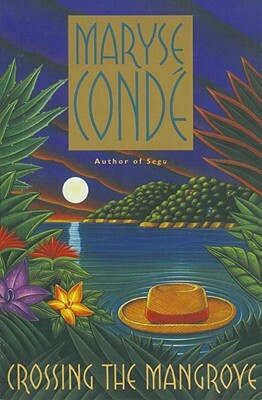 In this beautifully crafted, Rashomon-like novel, Maryse Conde has written a gripping story imbued with all the nuances and traditions of Caribbean culture. Francis Sancher--a handsome outsider, loved by some and reviled by others--is found dead, face down in the mud on a path outside Riviere au Sel, a small village in Guadeloupe. None of the villagers are particularly surprised, since Sancher, a secretive and melancholy man, had often predicted an unnatural death for himself. As the villagers come to pay their respects they each--either in a speech to the mourners, or in an internal monologue--reveal another piece of the mystery behind Sancher's life and death. Like pieces of an elaborate puzzle, their memories interlock to create a rich and intriguing portrait of a man and a community. In the lush and vivid prose for which she has become famous, Conde has constructed a Guadeloupean wake for Francis Sancher. Retaining the full color and vibrance of Conde's homeland, Crossing the Mangrove pays homage to Guadeloupe in both subject and structure. A native of Guadeloupe, Maryse Condé lived for many years in Paris, where she taught West Indian literature at the Sorbonne. The author of several novels that have been well received in France (both Segu and its sequel were bestsellers), she has lectured widely in the United States and now divides her time between Guadeloupe and New York City, where she is professor emerita of French at Columbia University.